It’s several years since I visited Castle Howard at Christmas. Why did I leave it so long? Then the children were young our primary focus was on visiting Santa in his grotto. This year, I was determined to visit without them in tow and as Castle Howard is just 5 miles from Spring Cottage, I had no excuses! 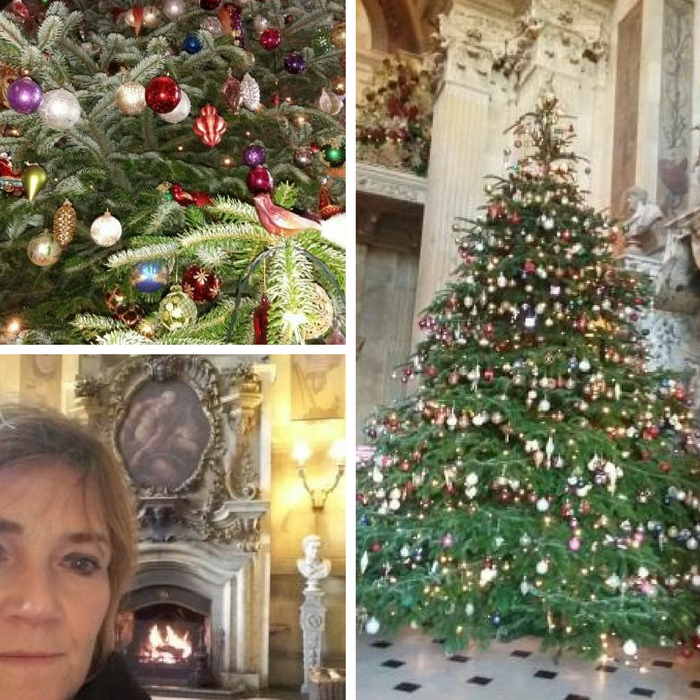 My lasting memory of Castle Howard at Christmas (apart from Santa’s Grotto) was the huge tree in the Great Hall. Huge as in 22 foot high! It’s so impresssive. And what better place to admire it from then standing in front of the hall’s huge roaring fire. You should see the size of their logs! And as for how may baubles there are on the tree – 100s if not 1000s. Before reaching the Great Hall I was blown away by the attention to detail and array of lights and accessories adorning the public rooms. From the staircase when you first enter the property to Lady Georgina’s bedroom – simply stunning. Each room had it’s own sophisticated design and colour scheme and roaring fires. Something that perhaps I didn’t pay much attention to last time as I was being dragged around on our mission to find Santa! 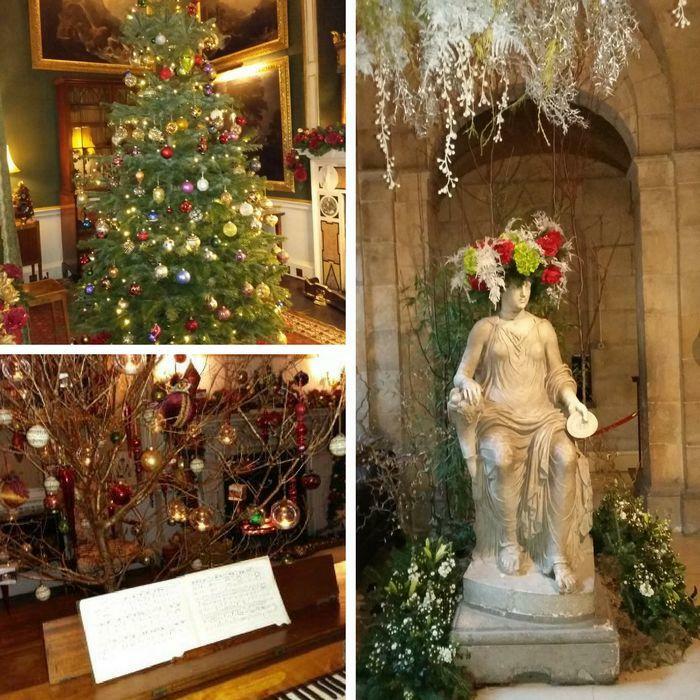 It’s worth spending a while in the Long Gallery and be serenaded by the jazz band in there,getting you all festive as they play Christmas tunes, while admiring the Christmas tree with golden roots inverted and suspended from the ceiling. If you do visit with juniors, there is a gingerbread trail to keep them engaged. Plus there’s a model of Castle Howard made out of gingerbread, as you can see in the above photo but this isn’t part of the children’s trail! I chatted to many of the friendly room guides – a mine of information. 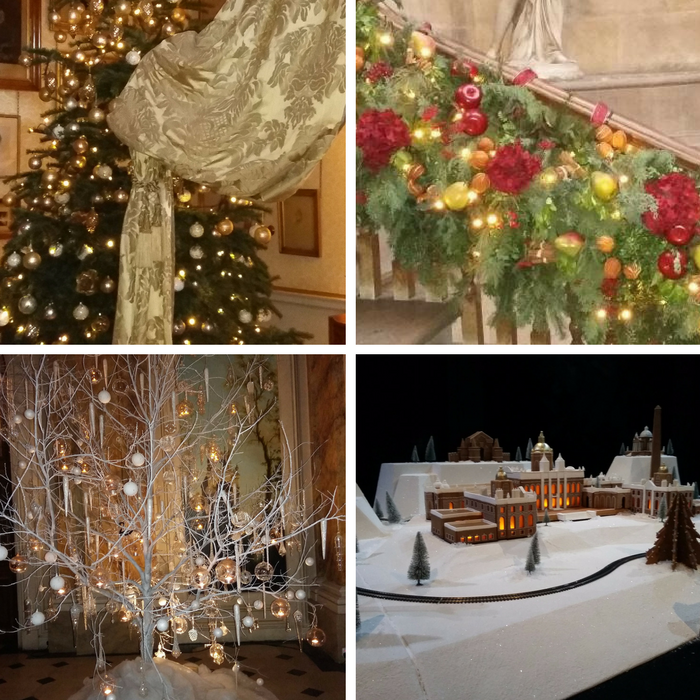 All the trees and tree branches used (the white tree above is only a branch) come from Castle Howard’s estate. 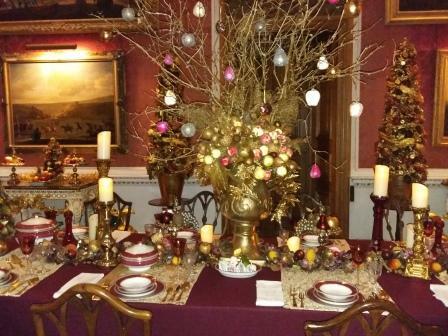 One particularly charming guide told me he thought 2016 was the best the house has ever looked at Christmas. How’s this for a dining table centre-piece? I took plenty of photos to use as Christmas decorating inspiration for when I got home. 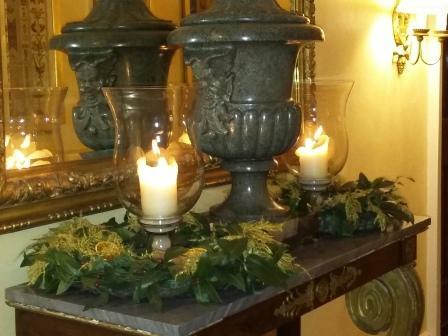 I particularly loved their side table decorations using a candle in a hurricane lamp surrounded by a wreath. An idea I plan to steal! A word of warning, be prepared to get tree-envy, bauble-envy, style-envy, table centre-piece envy, fire-place envy, candle envy, wreath envy. You name it, I had it! The tour ends in the shop and of course you just have to buy another bauble for your tree after being so inspired. The friendly lady behind the till told me that the lady responsible for creating such a jaw dropping Christmas display was their buyer and she was around if I wanted to say hello. I thanked her but said not to bother as I’d written a comment in the visitors’ book to say how impressed I was. 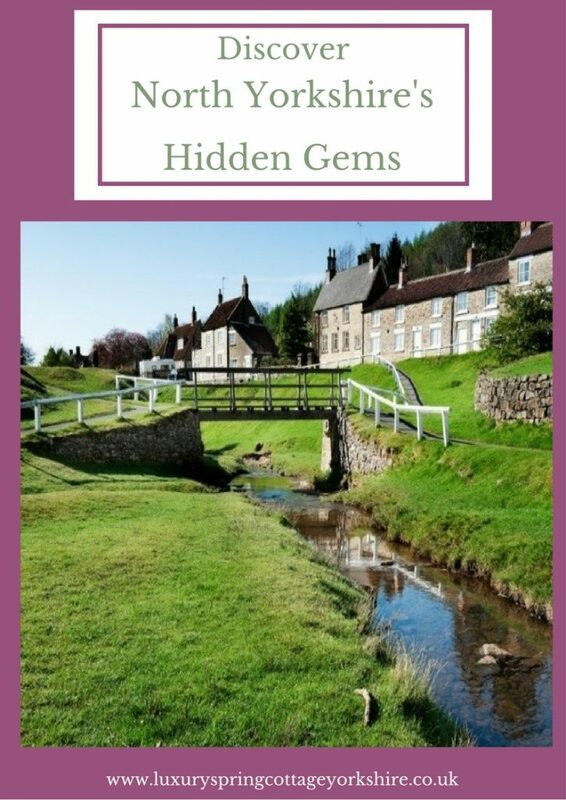 I wrote “Simply stunning and truly magical”. What more is there to say! 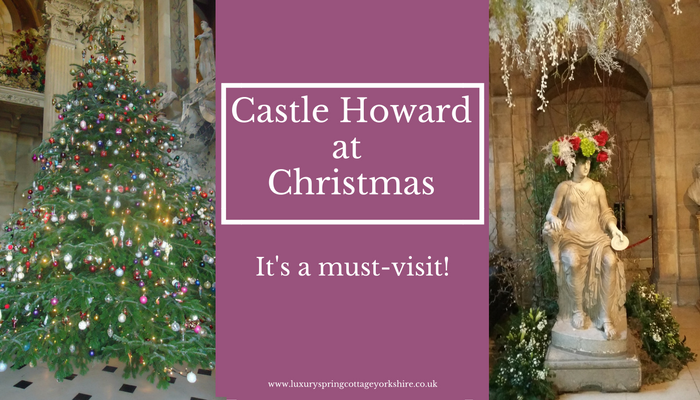 I’d love for you to be able to experience Castle Howard at Christmas for yourself. Be quick, they close their doors on Friday 23 December. 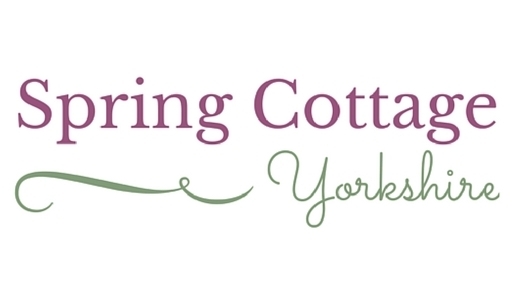 I’m offering a special 2 night, 3 day stay at Spring Cottage for only £299 with flexible start dates. Call it an early Christmas present. 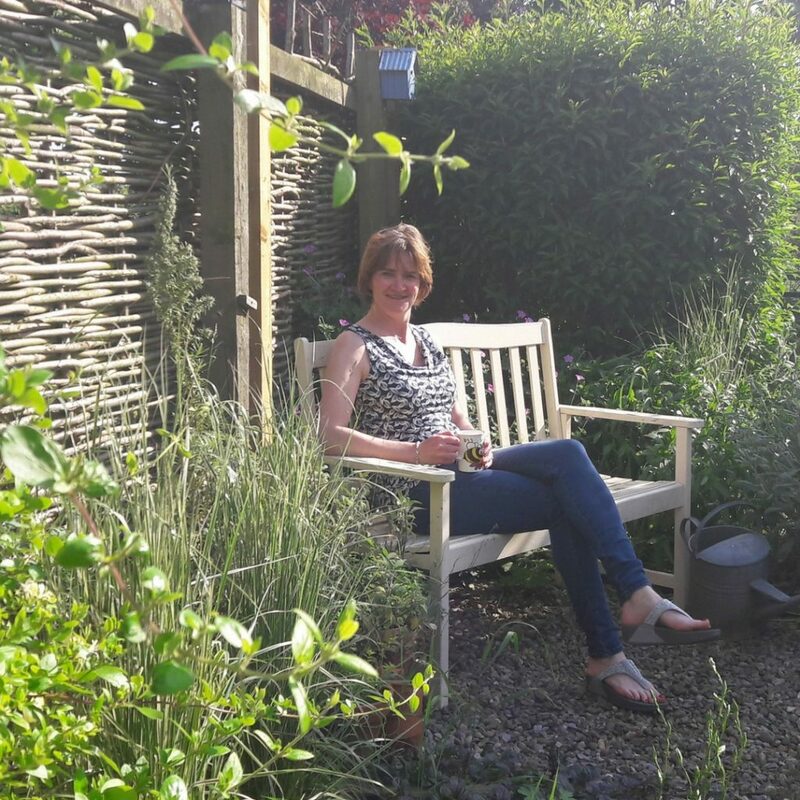 A Walk Near Castle Howard – In Yorkshire’s Green And Pleasant Land Afternoon Tea At Castle Howard Easter At Castle Howard A holiday cottage near Castle Howard and the great house itself have more in common than you’d think! Makes me want to visit Castle Howard. . One of these days we will have to set out on a GB tour. 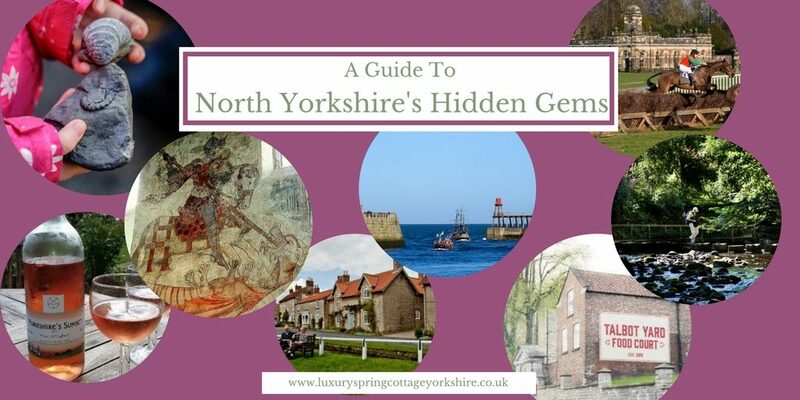 There is so much to see . . Spring Cottage looks a lovely place to stay when we do.